Your child is sick, lethargic, and too young to speak. So you euthanize it, right? Of course you don’t. It’s simple common sense. But common sense gives way to bureaucracy as was the case when a baby whale was stranded on a sandbar just off of Long Island. Local agencies and volunteers were at the ready with equipment and other resources that would have freed the whale and given the stranded mammal a fighting chance. However, due to the whale’s protected status, NOAA was alerted and given authority to determine what was best for the whale. Some locals claim to have been threatened with arrest if they were to attempt a rescue. Volunteers were understandably outraged as NOAA did nothing. 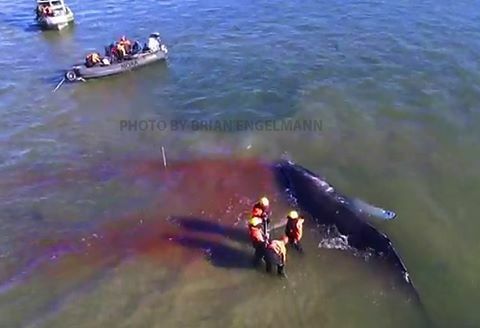 Ultimately the whale was euthanized “in the best interest of the whale, to end its suffering”. Since when is killing an animal that is still actively trying to free itself “in its best interest”. This is the kind of nonsense and the same people that we are up against when it comes to our fisheries management issues. Help us provide a voice of common sense. Cover photo provided by Brian Engelman.